Legend has it that many years ago a man lit the first flame, preserving the age of fire and preventing the age of darkness from taking over, that man was the first of three warriors, related by blood, which would go on to become Lords of Cinder; these warriors had in common other than blood, the desire to master their own skills: Raw Strength, Sorceries, Pyromancies. This is the tale of the third Lord of Cinder, the Rogue Pyromancer, Artlas Emberman. Abandoned when he was just 2 years old to a group of warriors up in the mountains, Artlas Emberman never could achieve physical perfection like his ancestors, no matter how much he tried, so he decided to achieve perfection in another way, through an ancient skill, Pyromancy, the art to bend fire at will. Not having a proper teacher, Artlas travelled far and wide in search for pyromancy scrolls, this search brought him to prohibited lands, where he gained knowledge without his knowing of prohibited dark pyromancies, which consumed his body through a terrible curse; legend has it that Artlas Emberman still bears the mark of the curse on his eye, even beyond death. Returned to his homeland, Artlas faced his village, which saw his new found skills as a betrayal, this led to his exile. He believed in the heart of pyromancies, and so he embarked on a journey to rekindle the first flame in order to prove his value to the village. 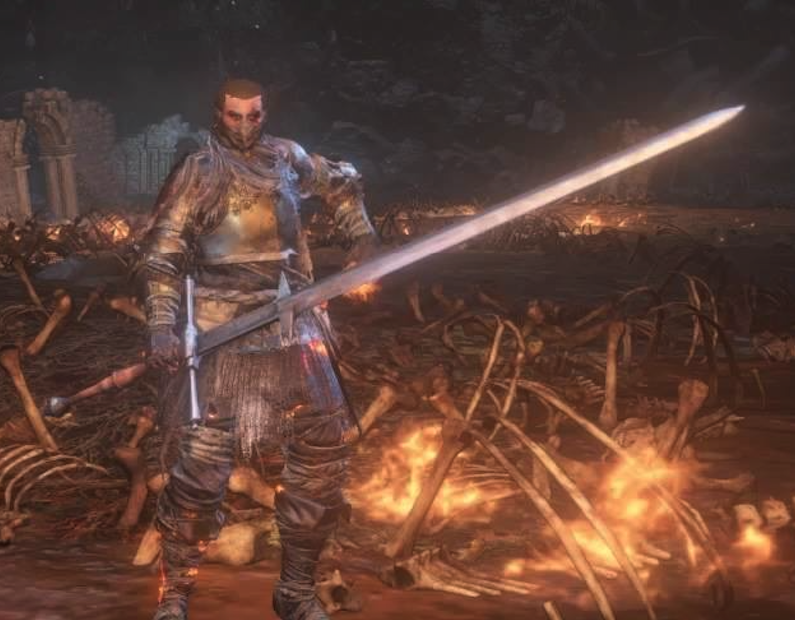 Sadly, he still wasn't ready to take on the various foes on his way, and so he perished (some say that he rotted in a cell at Lothric Castle, near the High Wall), but his legend doesn't end with his death, in fact it just begins, after his death he managed to master pyromancies, defeat the Lords of Cinder and help create a new painted world. PvP: Roll around until you see an opening, at that point use your mighty bass cannon to destroy their gaping dragon. If you are a brave boi, then you can attempt to confuse the dung pie out of them with your Demon Scar (pro-tip: run around until you bait him into attacking, then weapon art their entire family). If the guy is healing/charging an attack/running away then just slap the humanity out of them with a Chaos Bed Vestiges. If your opponent is easily evading your attacks, you can try using Black Serpent to corner them into a limited position, which will be soon known as their grave. ONLY IN INVASIONS: if A) you're getting ganked or B) the enemy is approaching you but hasn't spotted you yet, then Sacred Flame the devil out of them/him.